If you are putting on a concert you want to make sure you use the best possible piano you can. 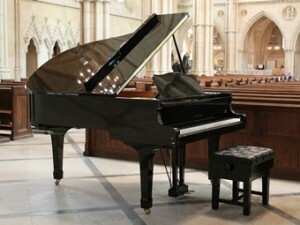 If you don’t have access to a piano that fits the bill then you can hire an instrument from us. We have a range of quality upright and grand pianos that are available to hire for a wide variety of events. Whatever the occasion be it a special birthday, a wedding, or even a family party we have pianos that would be suitable. If you need a pianist for your event we have details of some local players that might be able to help you. All the transport, tuning and setting up is undertaken by our experienced team who have all the necessary equipment required to deliver to a wide range of venues. We supply pianos for several local theatres including the Capitol in Horsham, the Hawth in Crawley, the Dome in Brighton and various local recording studios. Several local hotels such as South Lodge also employ us whenever they need instruments either for guests or for weddings or commercial events. We are equally happy to supply to a local church hall or even, as we did recently to a bluebell wood in a country estate. Wide range of pianos to choose from. Liaising with the venue to arrange the logistics. Tuning of the piano on-site, if required.